Okay, first things first. Let's start with the question everybody who's seen this so far has asked me. I have no idea why it's called "The Graft". 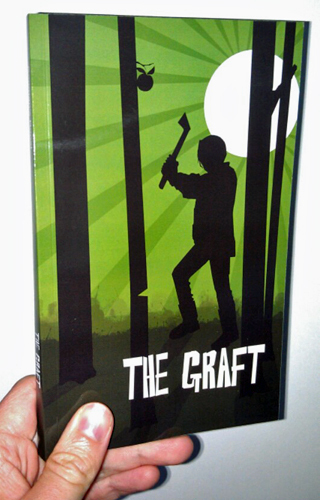 It's not the title of one of the stories, in fact I'm not convinced the word "graft" appears in the book at all. I don't know why the cover has no mention of Chapter One, short stories, the competition itself, or even 2010. All the other competition anthologies I've seen (Bridport, Bristol, Willesden Herald, etc) have at least a hint of what they are and where they've come from. I kind of like the cover image, in a way - it's simple and striking enough, but again seems to bear no relation to any aspect of the contents. Or, if there is a story about a midnight lumberjack wearing pirate boots and chopping down an apple tree, I must have missed it somehow. Maybe it's a metaphor, for something. The contents are the important bit, of course. I was a little surprised that there was no foreword or introduction, but that's obviously not essential - again, it's just the kind of thing that you usually get with a competition anthology. The stories themselves are, to resort to an over-used expression, a mixed bunch, although it was interesting that most of them were contemporary (mine is, but I thought there might be a few more historical stories or some science fiction or fantasy), and generally serious. I thought the quality varied considerably - there were some pieces that gave the impression of the writers being very new, with awkward phrasing and a few grammatical stumbles spoiling the flow of the prose. On the whole, though, the writing is pretty good, and although the majority of them are concerned with relationships, the stories show plenty of imagination. Sometimes competition anthologies get a bit samey, with the judge's personal taste stamped a little too firmly on the selection. That doesn't seem to be the case here. Highlights for me were the story included came second, Dorothy Schwarz's Requiem for Lisa, a poignant tale of a woman obsessed with her voice coach but lacking any real talent for singing, striving desperately to perform one song perfectly so she can win his heart. Last Rites by Benjamin Dipple makes effective use of a dual timeframe, dual location narrative to tell the story of an elderly poet about to receive an award for his latest work, a book of poetry that draws on terrible memories from his past. And Ben and the Bomber by Susi Holliday, set during the Second World War, which includes some fantastic period detail and a heart-rending conclusion. So the stories themselves are generally strong. It's a shame, then, that they're let down by the presentation. The general quality is fine - it's similar to my anthology, a typical print-on-demand grade of paper and glossy cover, which some people don't like but I think is perfectly acceptable. It doesn't say who was responsible for the editing, but although all the stories use the same font, there are big differences in how they are laid out. Some of the stories use indenting for paragraph breaks (although they are unusually big indents), while others look more like they're formatted for on-screen reading and one or two have no gaps or indents at all. This is possibly something I only noticed because a rogue line break turned up in my story, giving what should just have been a regular paragraph change unnecessary emphasis. It definitely wasn't like that in the proof version I signed off. In some of the stories there are missing words, typos, or commas in odd places. These are small details, I know, but flaws like that do take the shine off the finished product. The annoying thing is that with a bit more effort, this kind of slip could have been avoided. The Graft has been two years in the making, after all. The prizewinning stories in the collection represent an outlay of £4000, and by my reckoning that kind of expense justifies a little more polish. And considering the organisation behind this is Chapter One Promotions, there was a distinct lack of any announcement to herald the book's release. No launch party, no mention on Twitter, no Facebook page, nothing. I can't imagine anybody who's not got a story in the book has any idea it's been released. You have to dig around on the Chapter One website to find it, and when you do, it's very expensive - £12, plus £2.50 for UK P&P. There's no other option - you can't buy it from Amazon and there's no ebook version. Ultimately, the anthology seems like a wasted opportunity. It missed the chance to sell to people to people looking to enter the 2011 competition, and now that it is available it's too expensive and too hard to get hold of, plus it's let down by some sloppy editing. All this means I'm very reluctant to recommend it to people, which is a shame, because there are some good stories in there. Just further evidence that C1P is the most incompetent organisation this side of Alpha Centauri. I agree with Perry. Everything I've heard about them has been pretty shoddy. I'm sorry that the excitement of winning has been tarnished for you because I'm sure that your story is excellent - your other work is! Oh, Dan. I'm so sorry this experience has been an expensive, glossy let down for you. You deserve trumpets and a fanfare launch, and the book should come with feathered headwear to shimmy in appreciation for your words! I'll get making one for the next book you're bound to be in! Ha - and there's extra lashings of word verification letters for you! There are so many elements to running a writing prize that they do badly. But making the anthology practically inaccessible by the 2 year delay and pricing and marketing is the worst disservice to the writers and the work in there. I'm glad you have some closure and I know that your story will be read and marvelled at by many, just not in there. I think we should all start writing the word verification as a way of goodbye. Thanks, everyone. Sorry if this post came across as a bit moany. I suppose I was getting it off my chest but I definitely wasn't trying to get anybody to feel sorry for me. I mainly wrote it to end the saga and, hopefully, move on. I think what perplexes me more than anything is why they bother with the anthology at all. It does nothing to promote the competition, is a source of disappointment to the featured writers, and can't really be expected to bring any profit in for C1P. So why not just put the stories online when the results are announced and have done with it?